In late March 2007 I stumbled on the answer to what happened to "Little Brother", the son of Maria and Charles Wood, who was born on Alcatraz Island, California in 1865 the close of the civil war. As you will see, this information just leads to more questions! Early in my family research I learned of the existence of Charles from a letter I obtained from the National Archives. It was a letter from Maria Wood to the head of her son Henry Roome Wood's school in Frankfort, Germany. Edith Vyn knew of this son, and remembered stories told her by her grandmother Eugenia Roome Wood Howe that Eugenia pushed him around in a baby carriage on the Presidio in San Francisco. Edith recalled hearing that "Little Brother" tragically died around age 20, which would be around 1885. The birth of Charles is recorded in the 1855 autograph album Joan Graven, my father's cousin, gave me a decade ago. Maria herself records the birth of her son Charles (and of all her children, the first two recorded in French, the birth of her last child Charles recorded in English). This appears to show "Little Brother" dying around age 76! Look at the birth date. When I saw this I walked over and got Maria's autograph album and looked up her son Charles' birthday - September 26, 1965. This has to be her son. How much more verification can I find? As it turns out, plenty. 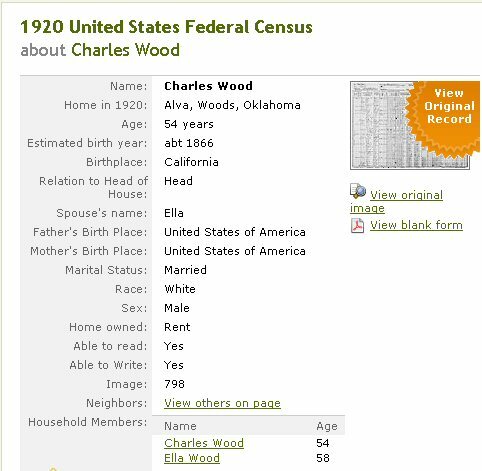 This Charles Wood can only be our Charles if Sarah C. is his aunt and the sister of his father Charles O. Wood. The age is wrong, Little Brother should be 15, not 13. But he is born in California, his father is indeed born in Indiana, and note that is says his mother was born in France. We have always believed her first husband, the mysterious Mr. Roome was born in France, but here Maria's brother-in-law or sister-in-law states that Maria herself was born there. 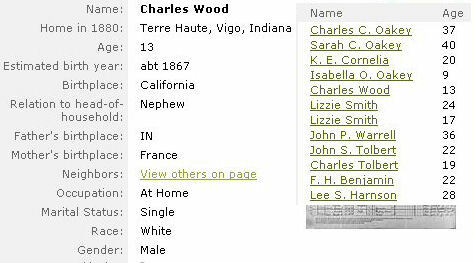 It is an easy matter to show from the 1850 federal census for Terre Haute that Charles Ogden Wood indeed has a sister named Sarah C. Wood - it does appear that his sister has taken his son into her household to raise. Charles and Cornelia are the parents of the first Charles Ogden Wood. The Wood grandparents are dead by 1880. Also, one must accept that someone shaved 2 years off Sarah's age when the 1880 census taker came by. Look at the image to the immediate left and the next two below. Little brother's wife's name is Ella, which remains constant. He is born in California, and it even lists his birthday as September 1865. It says Charles' parents are both born in Indiana, when only his father was. His wife is listed as born in Pennsylvania, as were both her parents. Little brother is 34 and a cigar salesman. I can't make out what his wife does, but they have a servant. 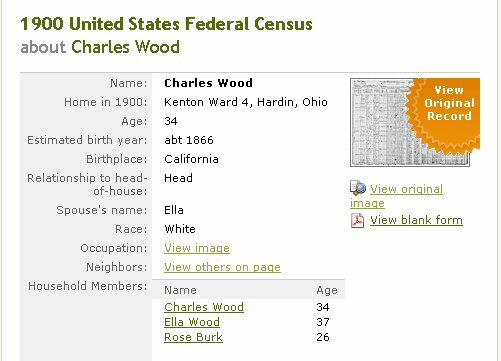 Here Charles Ogden Wood II is in the 1920 census - I cannot find them in the 1910 census. He again lists his birthplace as California, but says he doesn't know where his parents are from. Of course, his wife could be the one supplying the information to the census taker. Now Charles is a manager at a light and utility company. 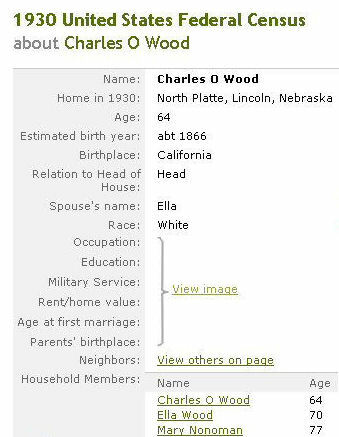 Here Charles Ogden Wood II and his wife in the 1930 census - his sister-in-law is living with them in North Platte Nebraska. Again Charles is a manager at a light and utility company. He is born in California, his wife is again Ella, his father was born in Indiana but I don't believe his mother was. I am not sure of the nature of any relationship between Henry and Eugenia, the adopted children of Charles O. Wood, and his natural son Charles. Just to reiterate, the three children Henry, Eugenia, and Charles share a common mother Maria Roome Wood. Henry was 11 years older than Charles, Eugenia 9. When Maria dies in 1875 it seems this family looses it's center. Henry has a son William by his first wife who dies at age 20. Perhaps there was confusion in later generations about which unfortunate young man died. The obituary of Henry says his son Howard (by his first marriage) and his sister Eugenia came to the funeral, no mention of half-brother Charles attending. I have to see if I can find an obituary for Eugenia to see if it mentions Charles. The obituary in the Washington D.C. paper for the elder Charles Ogden Wood mentions that his military papers will be "... a proud legacy for his only son". Which son - his adopted son Henry or his natural son Charles? The papers have come down through the family of H.R. Wood, was he the "only son"? Upon his death did Charles have the papers and get them to the heirs of H.R. Wood? We may never know.